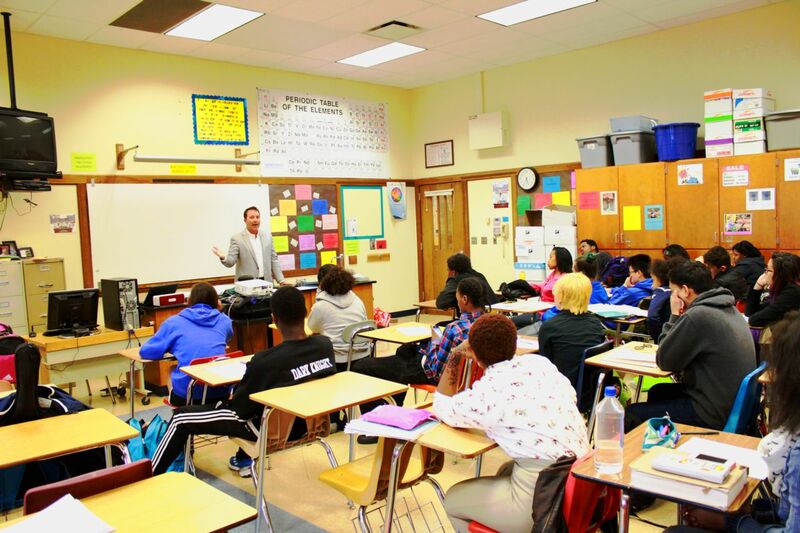 Attorney Jason Abraham Visits Driver’s Education Class | Hupy and Abraham, S.C.
Hupy and Abraham, S.C. Vice President Jason Abraham visited a driver’s education class at Rufus King High School in Milwaukee, and spoke to fifty aspiring drivers about several topics related to automobile accidents. Attorney Abraham also illustrated the path he took to becoming a lawyer and shared information from the biggest cases the firm has taken on, including the Milwaukee police brutality case that resulted in Curtis Harris becoming a quadriplegic. And, Attorney Abraham briefly discussed what steps the students should take if they ever find themselves in an accident. Attorney Abraham has visited several schools throughout Wisconsin to help educate teenagers about driving safety. Focusing on the importance of not texting and driving, Attorney Abraham shared several shocking facts, including the statistic that 34 percent of all drivers have admitted to texting while driving. Following the lecture, the students took a quiz that covered the lecture’s material. In addition, every student received a bag of Hupy and Abraham safety items, including the popular DNT TXT N DRV bumper sticker. Click HERE to get your own free sticker. Hupy and Abraham, S.C. has made several efforts to reduce the amount of accidents that result from texting and driving. Attorney Abraham and his daughter Ali have starred in several public service announcements urging all drivers to stow away their phones before operating a vehicle. To view these public service announcements, visit Hupy and Abraham on YouTube.